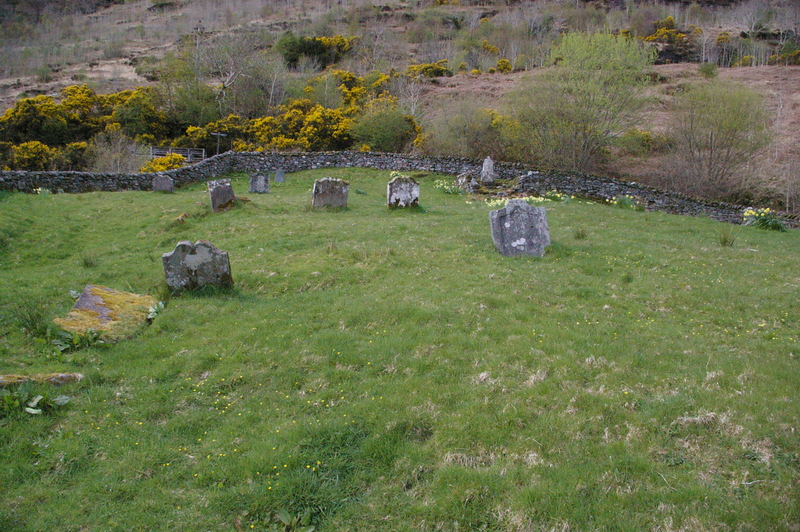 A handful of gravestones remain in the medieval churchyard of Kilmorich, surrounded by its enclosure wall. Just beside the Loch Fyne Oyster Bar, at the site traditionally called Clachan, an old graveyard surrounded by a wall and some fine trees is all that remains of the old medieval church of Kilmorich, Gaelic cill Mhuirich, ‘the church of Saint Muireadhach‘. The identity of the saint is not clear. The church itself has vanished, but a turf mound in the centre may cover some of its foundations. The church of Kilmorich is first recorded in the 1240s, when it was granted to the Augustinian Abbey of Inchaffray by Gillecrist filius Malcolmi Macnacthan (Gillechriosd son of Maolcholuim MacNachtain), presumably the head of the clan whose seat was at nearby Dundarave Castle (just along the shore of Loch Fyne at NN142096), the MacNachtans (otherwise MacNaughtan, MacNaughten etc). It would be interesting to know just why the MacNachtans thought that assigning their church to a monastery at some distance from their lands was a sensible thing to do. Why did they want to support Inchaffray? Could it be that they were trying to curry favour with the mormaers of Strathearn, who had established the Augustinians at Inchaffray four decades earlier? This medieval kirk of Kilmorich was abandoned and a new building erected 3 km away, on the other side of the loch, at Cairndow (NN180107) (càrn dubh, ‘black cairn’). 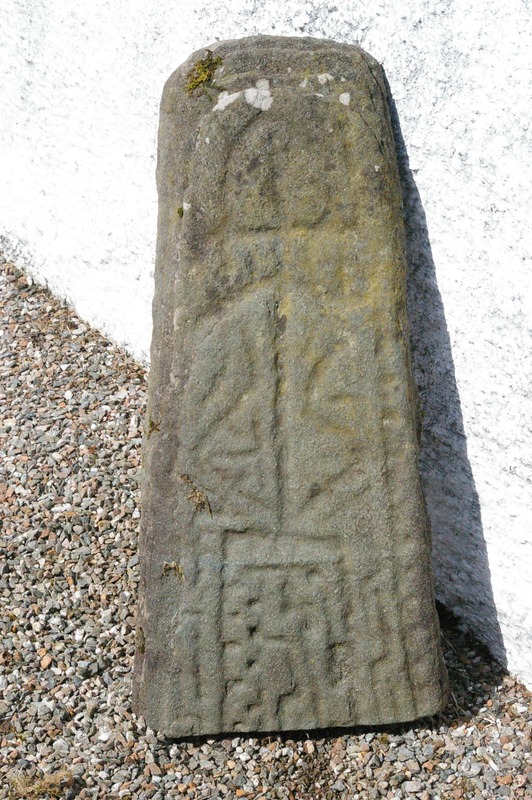 At Cairndow you may see a medieval font, a broken grave slab and a damaged cross-head of possibly 12th-13th century date. 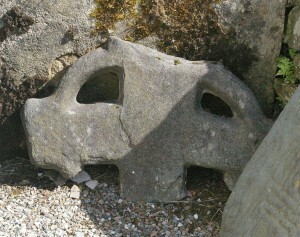 These probably all came from the medieval kirk of Kilmorich when the new building was built and the old site abandoned. It is worth making a wee detour from the old Kilmorich site to Cairndow to see them. A grave-slab at Cairndow was probably brought there from the old kirk site of Kilmorich. Now broken in two it lies behind the kirk, propped against the wall. 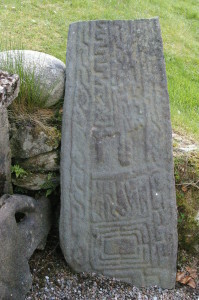 The lower part of the Kilmorich grave-slab, now at Cairndow. This fragment is all that remains of a freestanding stone cross that was originally erected at Kilmorich, now at Cairndow. Note that though the Cairndow church is now called Kilmorich Church on OS maps, it is not the original site. There are some fine big trees around the ancient graveyard. Perhaps some of these are the ones planted by the parishioners in 1819, after the move to the new kirk. The records of the Kirk Session say that a number of parishioners gathered and went to the old kirkyard carrying young trees and planted them there ‘for to ornament the place where their Relations who have gone before them & their Forefathers have been Deposited’. It was also directed in the minutes of their meeting, ‘that all the said plants be this day dedicated wholly for the use of the Poor of this parish and that none of the said plants are to be cut as long as they keep from withering, excepting where it may be found necissary (sic) to make room for the rest to grow.’ It is nice to note from this record that these people saw in trees both an aesthetic value (‘ornament’) and an economic one which would serve not landowners but the needy. There are two places to eat and drink nearby: the famous Loch Fyne Oyster Bar, and next door the Tree Shop Cafe has both food and drink and a wide range of plants and young trees for sale. A short distance up Glen Fyne (to the east) you will find Fyne Ales, with their brewery, bar and shop. There you can sample some of the excellent locally brewed beers – drink them there and take some away with you. For a good Ordnance Survey Map showing Kilmorich church site and roads and footpaths nearby, click on ‘View Larger Map’ below.